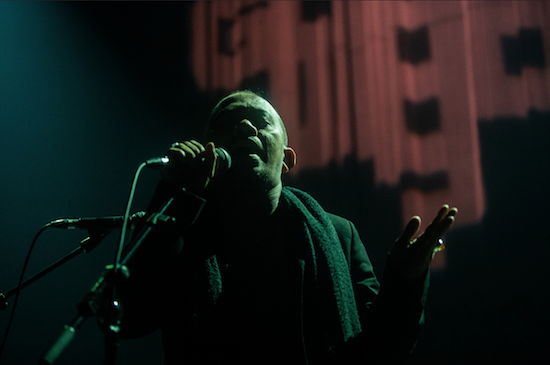 The Quietus | Features | Three Songs No Flash | The Mind-Altering Substance Of Éliane Radigue & Senyawa At Le Guess Who? The Mind-Altering Substance Of Éliane Radigue & Senyawa At Le Guess Who? In 1974, the modern-day ‘seer of Shepperton’, J. G. Ballard, musing on the abnormal psychologies wrought by our fragmented reality, offered a simple equation. He posed three broad existential categories, or levels: public events (“such as war, the conquest of space…”), everyday life (“of people who get in the car every morning, work at the office, convalesce in hospitals…”), and the ‘inner space’ of our dreams and fantasises. “These three levels… cut backwards and forwards across one another… points of intersection exist between them… when an event takes place on one of the three levels of reality… it necessarily affects the other two in a more or less perceptible way,” he observed. Although potentially daunting to digest, especially the realisation that your private thoughts are not harboured in a protective internal bay but play an equal role in shaping the ebb and flow of our lives, it also helps to comprehend an event like Utrecht’s Le Guess Who? Festival. Here, the ‘public events’ are the festival’s sprawling line-up of handpicked contemporary artists, while, for four days at least, attendees navigate their way through it all on an ‘everyday life’ level. But, with such an unusual array of sound around every corner, what is all this doing to our psyches? And, even more curiously, when our minds become over-stimulated and are altered by the confluence of venues and performances therein, what changes will be made, in turn, to our future lives and the world around us? The answer is, we don’t know and can’t know; but there was a certain, regular feeling that some of the sounds were operating like some kind of black box technology, challenging our cognition, where what was heard yesterday transforms all that is heard today and tomorrow. The festival's theme this year is "a celebration of sound". By pointing to 'sound' instead of 'music' the strapline makes for a more inclusive umbrella that covers the festival's peerless breadth of musical performances. But it also swerves the endlessly debatable boundaries of what gets called 'music', boundaries that some of the artists at the festival aren't afraid to cross. And it was through the deviant imaginations of these post-genre performances, that abnormal psychologies were most notably nurtured. Perhaps the clearest example of this is one of the festival's opening performances of minimal composer Éliane Radigue's 'Occam Ocean' by ONCEIM (Orchestre de Nouvelles Créations, Expérimentations et Improvisations Musicales). Situated in the Gothic Domkerk, the Netherlands' only pre-Reformation cathedral, the orchestra are overlooked by a statue of a harpist sat high atop a dauntingly large pipe organ bearing over the rostrum. Were it not for the ceremonial applause at the arrival of the players followed by the conductor's raised hand the audience would not have known the piece had started. Hushed and expectant, we strain to make out the slightest of tones produced by bowed acoustic guitar and accordion. The acoustics of the church conspire with the near-silence to amplify the audiences’ accidental eruptions: a single cough inspires copycat invasions; a lone ringtone furrows many a brow, while each glass knocked over turns heads. The subtle stresses of experiencing a live performance in such a formal space are magnified and seem to spread kinetically, but the group focus is brought safely back to the matter at hand as the accumulating tones gradually take command of our attention. Although, in sonic terms, the piece eventually forms the invisible but palpable sea of the title, ONCEIM’s delivery method is like watching tiny embers blown carefully to maintain a small flame. 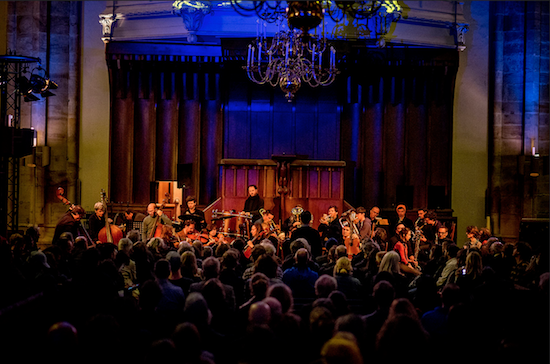 Responsibility for their radiant glow is gradually shared by each section of the orchestra, taking it in turn to contribute layers of vaporous sound in the reverent space. And yet, there's little in the way of musical events apart from the gradual start and a slightly less gradual end. In between, the passing of the flame from strings to horns to woodwinds and back again can only be identified by the eyes, while the ears receive a seamless suspended chord swimming with textures. It is more like a sculpture of elemental energy than anything approaching conventional music, and one where the closed eyes of the immersed tend not to stay closed for long - although steady, the tones’ unsettled edges feel like a portent - this is no yogic session. Despite the ancient setting and the traditional technology of an orchestra, ‘Occam Ocean’ is closer to today’s electronic music. Instead of the quicker science of tone generators or a laptop, Radigue's extraordinarily slow and imposing composition uses the orchestra as a set of analogue tools, relying on ONCEIM's superhuman steerage of their instruments. As an unchartered exploration of the world of man-made frequencies it delivers a three-dimensional sound world that turns time on its head. It’s a great example of how the temporal domain shared by music and sound works in many directions and layers, from the easy ones to measure such as duration and quantity of events to the way a sound is purposed - the age of the technologies and contexts - that can extend back centuries before a given listener were alive. When an artist mixes ancient cultural tropes with more modern ones they are playing with time, folding it and forming new psychological pathways in which to appreciate sound's domain. 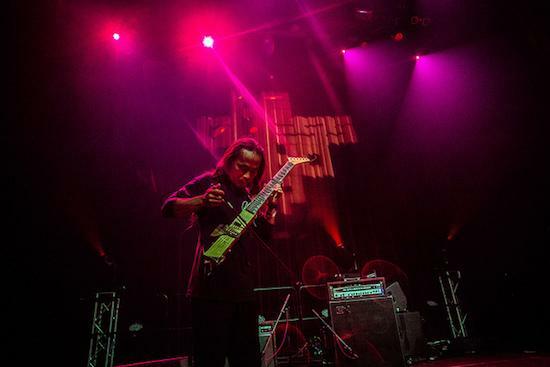 Senyawa, in channelling traditional Indonesian music into a modern experimental framework, give Western ears a challenging form of temporal tourism. Their performance at Le Guess Who?, the first on their current tour based around their new album, Sujud, bears an even greater weight than their recordings, yet reveals the sparsity in their set-up. The uncluttered stage of just an amp and two microphones belies the intense, numinous performance that follows. In many ways it is the inverse of Radigue’s piece: instead of using old technology to form a long, modern composition, Senyawa’s series of short pieces use contemporary methods to arrive at ancient sites. Wukir Suryadi deploys grinding rhythms and folk pickings with hand-built electric guitars that brush by noise rock, thrash and black metal realms like a skimmed stone on a particularly stormy sea. Meanwhile Rully Shabara takes command with a fearsome vocal range that goes from the abyssal bass of Laibach’s Milan Fras to the wraith-like wails of Einstürzende Neubauten’s Blixa Bargeld. His performance seems to take on a devotional, ritualistic mode that inspires a feeling of intense reverence of something primal or eternal even. That this is clearly communicated despite the language barrier is bewildering, yet, perhaps, goes toward some kind of innate theory where the time lines in Senyawa’s song stir latent memories and associations that are universal. “With over 7 billion people on the planet, the music we hear is only a fraction of what’s out there. This is the instinct that keeps us digging.” This message sent out via Twitter by Le Guess Who?’s organisers shortly after the festival had finished neatly encapsulates the ‘One World’ spirit that permeates the festival. Their mining extracts what seems to be the most wide-ranging yet highly selective line-up on the planet. Taking place on the first of four days, ONCEIM and Senyawa’s performances were just the beginning. In the days that followed there was JPEGMAFIA violently spitting out his intense and frenetic collision of trap and hip hop, Joe Coleman’s raw, tragic beat poetry, the dark yet healing hues of Jozef van Wissem’s meditative lute, The Bug and Miss Red’s seismic and addictive acid ragga plus not one but two single-day sub-festivals – Lombok’s programme of international roots music and Le Mini Who?’s showcase of mainly local contemporary scenes. But why did the less idiomatic performances feel the most potent in altering minds? Like when Lucy Railton’s cello and modular synth set saw her using all four limbs to coax microtonal phenomena from her cello, at times producing a truly disorientating sensation like falling foul of a trap door. Or later as Maja S. K. Ratkje possessed us with her unparalleled voice, the most ancient of all instruments, in a solo improvisation with electronics that spun song, screams and sighs while catching sound objects like a thumb piano, a radio and the crackle of an ectoplasmic cellophane in its wayward web. Throughout the festival there is notably less merchandising and marketing than other events of its kind, which gives everyone a bit of a break from the daily migraine of unsolicited messages, freeing up our inner spaces to better comprehend the programme. Maybe this unrivalled opportunity to focus on works that operate off the grid on multiple timelines, connecting us to the past at some genetic level yet shockingly new at the same time, opens up hitherto dormant pathways for our neurons to travel. If Ballard’s hypothesis on how our psyche can affect the material world is true, then the abnormalities Le Guess Who? festival afforded us can only be positive. So, unlike the often bleak yet predictive texts he wrote portending our current dystopia, an abnormal psychology need not be a negative thing, and, in a world desperate for new mindsets, Le Guess Who? is a force for good, bringing us together and changing our minds.